Reigning ladies' world champion Ng On Yee will play in the qualifying rounds of the 2016 World Championship. 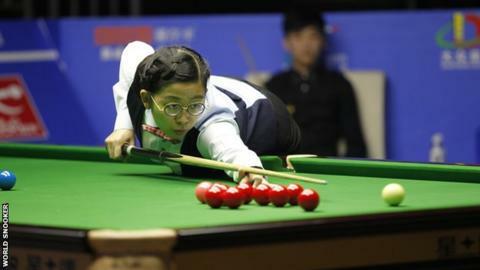 Hong Kong's Yee, 25, ended Reanne Evans' 10-year reign as world champion with a shock 4-2 semi-final win in 2015, before triumphing in the final. Yee follows Evans - who lost to Ken Doherty last year - in competing in qualifying with the men. "Playing at the very top level is a dream come true for me. I am excited to see new doors being opened," said Yee. "After such a good year of results in 2015, I want to build on that and try to become even stronger in 2016. "This added opportunity to compete with and learn from some of the best players in the world is a chance I am very grateful for." She will need to win three qualifying matches to become the first woman to reach the televised stages at the Crucible Theatre. The qualifiers for the 2016 World Championship will run from 6 to 13 April at Ponds Forge International Centre in Sheffield.